The Lotus – Renault 97T n.12 is a single-seater that participated in the 1985 Formula 1 World Championship. Designed by Gerard Ducarouge and Martin Ogilvie, the car was equipped with a very fast but high consumption Renault turbo engine. The English team engaged the young Brazilian driver Senna for the new season. 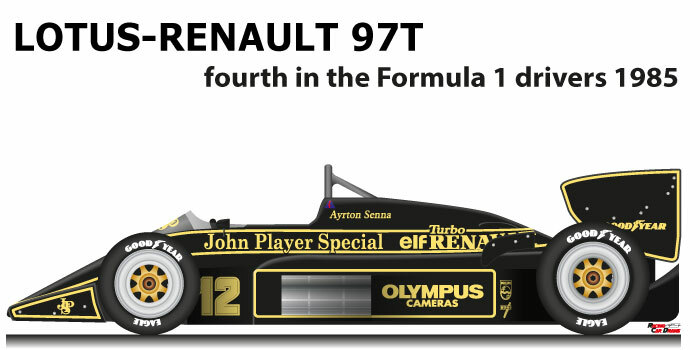 Ayrton Senna with the Lotus – Renault 97T n.12 arrived fourth in the 1985 Formula 1 World Championship. The Brazilian won his first victory in the Grand Prix of Portugal, demonstrating his skills in the wet. Due to high fuel consumption in some races of the season he was forced to retire due to running out of fuel. At the end of the year he also won the Belgian Grand Prix and won seven pole positions. Together with his teammate Elio De Angelis they took Lotus to fourth place in the constructors’ title.